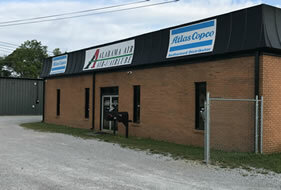 Lubricated or oil free air compressors, refrigerated or desiccant dryers, and complete compressed air systems with the highest efficiency, longest service life, and lowest cost of ownership from Alabama Air Power and Air-1 Airlube Compressors, your Atlas Copco Compressor Master Distributor. 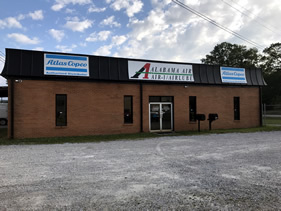 To better serve our customers Alabama Air Power and Air-1 Airlube, Inc. have offices located in Alabaster, Alabama and Dalton, Georgia allowing us to serve customers in the Southeast. 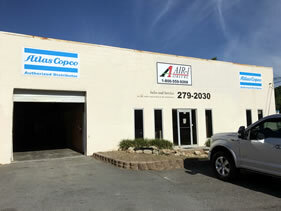 Alabama Air Power and Air-1 Airlube Compressors is a full line distributor for Atlas Copco Compressors with over 100 years combined experience. We know and understand industrial compressed air products, applications, and markets and offer compressed air equipment sales, service, and parts. Atlas Copco Compressors is a leading manufacturer of energy efficient compressed air systems offering reciprocating, rotary screw and centrifugal air compressors as lubricated or oil free machines; refrigerated, desiccant, membrane and heat of compression air dryers; air line filters; and air distribution systems. They also produce a full range of Variable Speed Drive (VSD), bringing a game-changing innovation to the general industry. 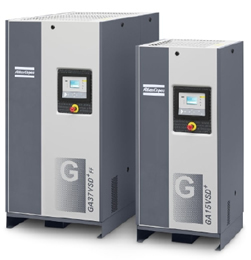 Atlas Copco’s GA VSD+ range brings a game changing innovation to the general industry that reduces your energy consumption by a staggering 50% on average, compared to idling compressors. At the same time it offers improved performance, quiet operation and a compact footprint, thanks to its vertical drive train design. All these benefits make the GA VSD+ the compressor of the future, setting a new standard in the industry for years to come. Use the handy Power Pay Calculator to estimate your annual energy costs for compressed air. Air flows easily through pipes and valves, quickly filling a space. It can be compressed to higher pressures and stored as potential energy. When the pressure is relieved, the compressed air can be used to perform many types of work. Compressed air is so versatile that it is often considered a fourth utility like electricity, natural gas or water. However compressed air is very inefficient; for every 5 HP of energy that is put into compressing air, only 1 HP is available as potential energy. Compressing air produces a stored volume at pressure and the byproduct of this process is heat. Heat is actually wasted energy from the compression process so the less efficient the compressor or blower, the more heat is produced. Compressing air creates heat and concentrates water and other contaminates. These must be removed for efficient use in an industrial compressed air system. Clean, dry air allows pneumatic instruments, valves, and controls to operate reliably, keeps pneumatic equipment running at peak efficiency, and extends the service life of air tools, motors, and cylinders. Dry air also helps ensure product and process quality. All of Atlas Copco Compressor's compressed air dryer, filtration, distribution, and conditioning products are designed for low pressure drop, high efficiency, and durability, for the lowest cost of ownership and long service life. A variety of terminology, measurements and definitions are used to define and measure the volume, pressure, and other aspects of air compression. For example pressure may be represented as PSI (Pounds per Square Inch), bar (one atmosphere at sea level or about 14.5 PSI), pascal (Pa) etc. Volume may be represented as CFM (Cubic Feet per Minute), cubic meters per hour (m3/h), liters per minute (l/m), etc. These different representations can be confusing and even misleading. Compressor and blower manufacturers may represent the performance of their machines as ICFM (Inlet Cubic Feet per Minute), ACFM (Actual Cubic Feet per Minute), SCFM (Standard Cubic Feet per Minute), or FAD (Free Air Delivery). Visit our Resources section for conversion calculators, formulas, definitions, contacts, and more.